I’m back from vacation & as expected, the first day back has been a whirl of nonstop catch-up. I’m mitigating the pain by anticipating the release of some books I’ve been dying to read. I’ve pre-ordered all three and am impatiently counting down to september 15 & october 27.
up first is mindy kaling’s new book. I know you’re not supposed to judge a book by its cover, but as far as covers go, this one is a beaut. I’m in need of some good laughs and just straight-up awesomeness from a hilarious, successful woman, so I can’t wait to dive right into this one. 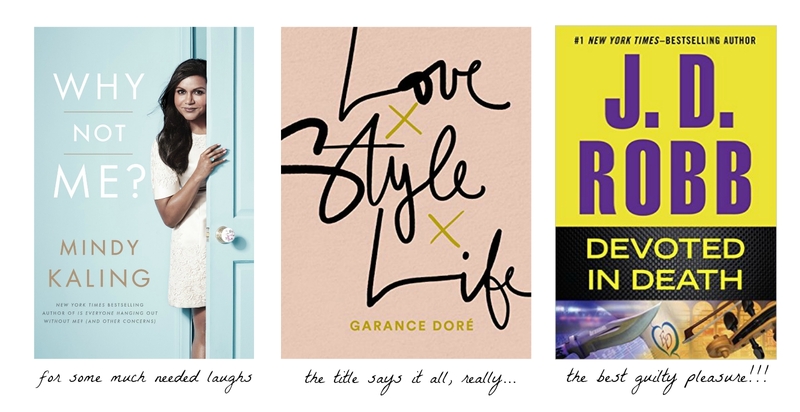 I’m just as excited about garance dore’s book. I’ve read her blog for a long time, and I’m excited that she’s branched out to a book. I find her incredibly refreshing; she’s approachable and inspirational at the same time, and most of all, genuine. fun fact: I am a die-hard nora roberts/j.d. robb fan. I’ve read all of the ‘in death’ series, so I’m chomping at the bit to read the latest installment. all of the books are a fantastic mash-up of humor, mystery, and romance. so, so good! ooh!!! you’ll have to tell me how you end up liking it! I enjoyed reading it!